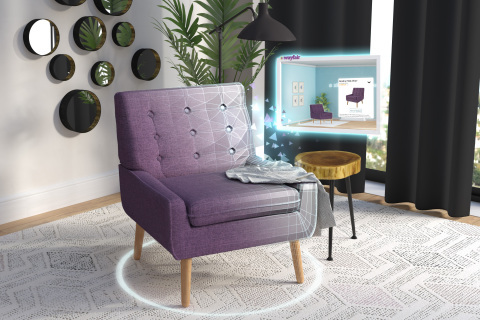 BOSTON--(BUSINESS WIRE)-- Wayfair Inc. (NYSE:W), one of the world’s largest online destinations for the home, today announced the launch of its mixed-reality (MR) commerce experience on Helio, the first-ever spatial computing web browser by Magic Leap. This first-of-its-kind, immersive shopping experience brings the search and discovery of furniture and décor off the screen and into the home, allowing shoppers to browse their favorite products through a boundless display and bring them to life in their physical space. The Wayfair web-based MR commerce experience is now available on Magic Leap One, Creator Edition. Powered by Helio, Magic Leap’s web browser, the Wayfair MR experience breaks the boundaries of traditional e-commerce. Shoppers can launch Helio within Magic Leap One, Creator Edition, place the browser anywhere in their space, and then launch Wayfair’s MR experience with just one tap. Browsing an array of furniture and décor, shoppers can interact with and view products up close, then seamlessly pull their favorite items into their physical space, where they transform into true-to-scale, 3D products. Shoppers can then move and rotate the products and experiment with different looks and layouts to design their entire space. The Wayfair MR experience, powered by Helio, will be a featured bookmark that will ship with Magic Leap One, Creator Edition™. Additionally, shoppers can find the Wayfair MR experience by visiting next.wayfair.com in the Helio browser. Wayfair generated $5.7 billion in net revenue for the twelve months ended June 30, 2018. Headquartered in Boston, Massachusetts with operations throughout North America and Europe, the company employs more than 9,700 people.